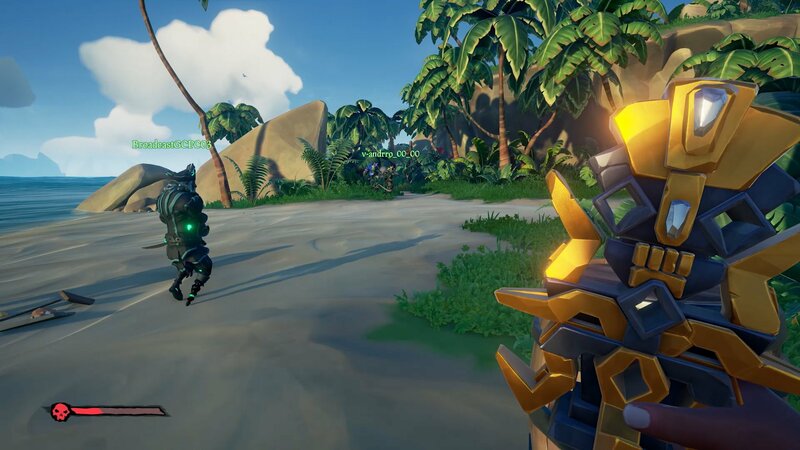 Tall Tales brings a 15-odd hour campaign to Sea of Thieves in the form of Shores of Gold and Shacknews was lucky enough to experience the introduction to this epic adventure. 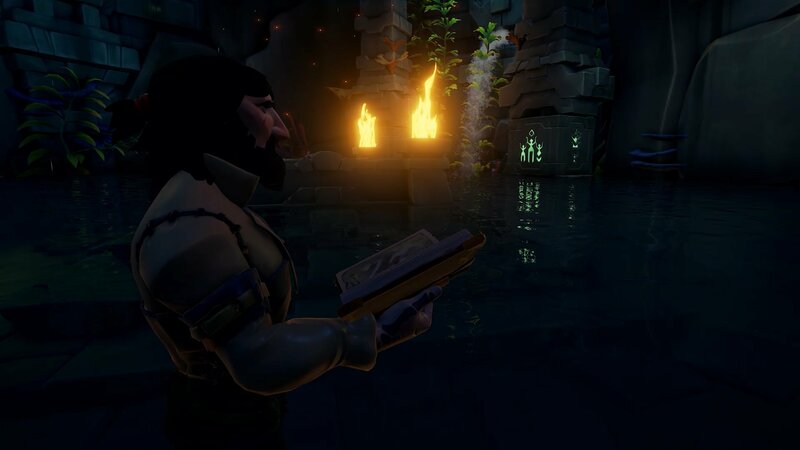 While Sea of Thieves has plenty of lore lurking around every corner, and epic tales happen every play session because of the emergent world, there hasn’t been a whole lot of story for players to experience. 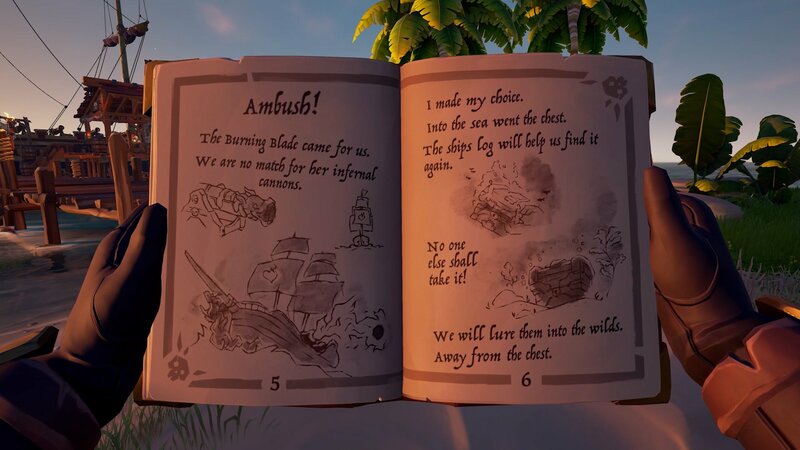 Rare is looking to drastically change this with the Anniversary Update when Tall Tales arrives, bringing with it Shores of Gold. Shores of Gold is the first Tall Tales experience and can be considered your more classic type of campaign. 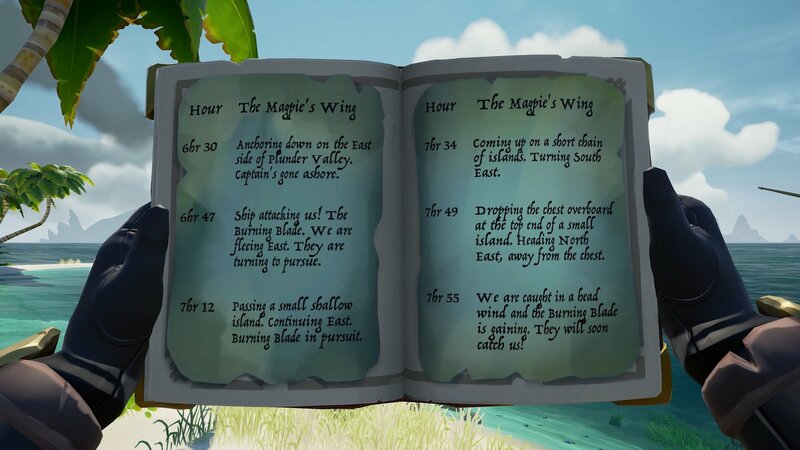 Consisting of nine unique quests, Shores of Gold will take players on an epic adventure to discover a new land beyond the Devil’s Shroud – the ever-present mist encasing the Sea of Thieves. Each of the nine quests weave in the pre-existing tools of Sea of Thieves while also introducing some new mechanics. Players will need to navigate the seas, adventure to islands, and read maps. But beyond that, Rare has introduced puzzles, traps, enchanted objects, bosses, pirate lords and a whole lot more narrative. My time at Rare saw my trusty crew – the same one that dominated in the Arena hands-on play session – start our adventure at Ancient Spire Outpost. The first quest as part of the Shores of Gold Tall Tale is called Shroudbreaker, and it’s where we began. The first quest, Shroudbreaker, begins by speaking with the Mysterious Stranger. 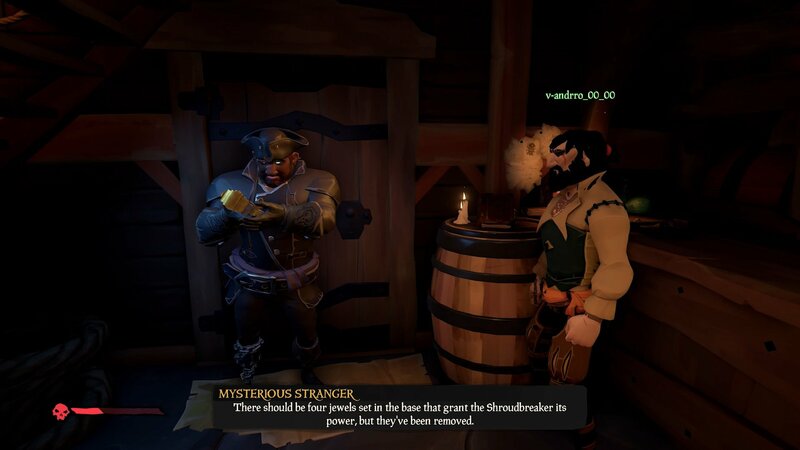 We approached the Mysterious Stranger in the tavern and were treated to a delightfully well-voiced story about an ancient myth concerning a tool that would allow pirates to part the Devil’s Shroud and discover new lands. 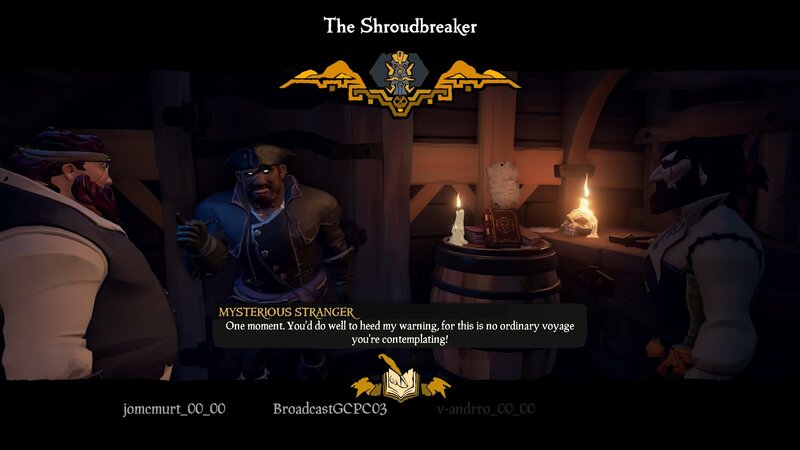 We were given a journal to read that detailed the fate of a legendary pirate ship and its precious cargo: the Shroudbreaker. It was up to us to decipher the clues and figure out where to go next. Right away there was an immediate sense of story and adventure without the need of encountering other players or even setting sail. A course was plotted and we were off to the island in question. A detailed journal reveals the story of the Magpie's Wing, a ship that carried the coveted Shroudbreaker. With the uncharted island in sight, we dropped anchor and began our search for the wreck of the Magpie’s Wing. Someone from our crew found the ship’s log sitting in what remained of the captain’s cabin. After returning to our ship we read about the Magpie’s Wing’s route, and figured out where they threw their treasure overboard. We were led to a small island where we found a new type of treasure chest. In the past, all treasure chests were simply handed over to the Gold Hoarders in exchange for gold and reputation. Coming with the Anniversary Update are treasure chests, actual chests that can be opened, looted, and have items stored in them. The chest we located contained a small scarab totem and additional pages missing from the journal. Crook’s Hollow was our next stop where we hoped to find somewhere to use the totem. A new type of treasure chest allows players to easily ferry around more than one item at a time. 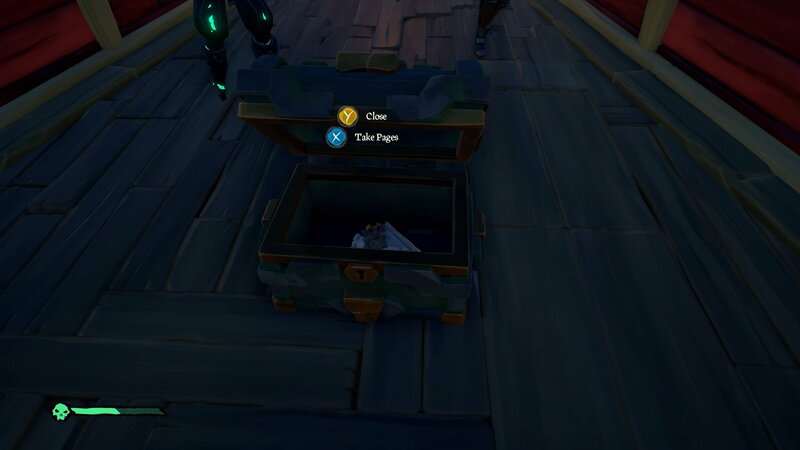 These chests can also spawn with gold in them. Upon scouring the island, we discovered a little pedestal that would accept the totem. The wall in front of us began to shake as a large stone slab slid out of the way, revealing a cave. We ran inside to see four stone pillars holding up the ceiling and a large stone table in front of us with a brazier in each corner. We lit the braziers all at once and the cave door shut, locking us in. I panicked and did the only thing my chimp brain could think to do: press the big button on the table. It was not the right thing to do. Water started pouring in from one of the pillars. I panicked and pressed the button again. At this point, my chimp brain evolved back to a human's and I realized this probably wasn’t the right course of action. The crew gathered together and began looking at the only thing we had on us, the journal given to us by the Mysterious Stranger. 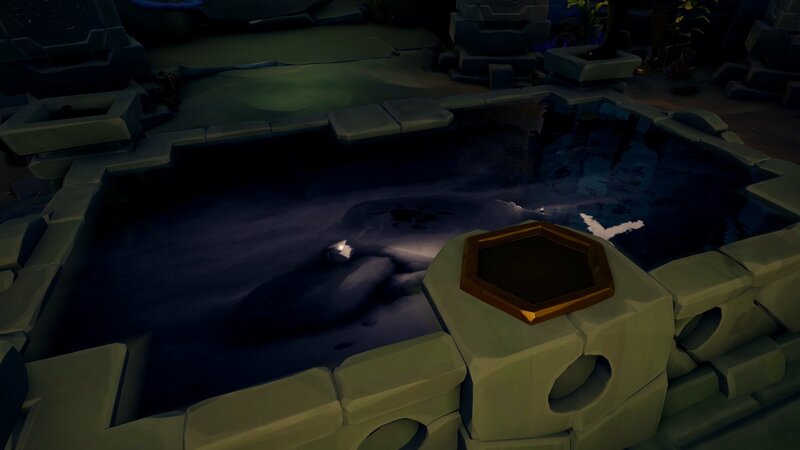 Puzzle rooms like this are just one of the new features coming with the Sea of Thieves Anniversary Update. As we stood there thumbing through the pages, water was spilling in from two stone pillars, rising to our pirate’s knees. We quickly discovered that there were symbols in the journal that matched those on the pillars. As it turns out, the blocks on the lower section of the pillars could spin, revealing new symbols. We matched the pillars to the symbols in the book and pressed the button, the pillars reset and we input the next sequence, and then the next. The cave door opened and the water drained from the room, but what’s more, the surface of the table shimmered, revealing an image. It was of an area on the island with an “X” over a piece of land. We ran outside, located the spot and dug up a medallion, only to be ambushed by a new coral-type skeleton. Returning to the room, we discovered there were spots for two more medallions on the table. The stone plinth activated, revealing a location for the crew to dig. We went out and found the remaining medallions and placed them in their appropriate slots. A secret compartment in the cave opened up revealing the Shroudbreaker. We nabbed the unique object and exited the cave, only to be ambushed by endless waves of coral skeletons. With the skellies on our heels, we ran back to the ship and returned to the Mysterious Stranger. The quest came to a close as the Mysterious Stranger revealed that the Shroudbreaker, the object we handed to him, was actually missing some pieces. If we wanted to have a chance of parting the Devil’s Shroud and reaching a new island, we’d have to hunt down the missing pieces. This was where our adventure came to a close. With the Shroudbreaker claimed, all that stood between us and completing this first of nine quests was an endless horde of coral skeletons. The whole quest took us perhaps an hour and a half. Across nine different quests of increasing difficulty, Design Director Mike Chapman estimates players could spend anywhere between 10 to 20 hours completing the Shores of Gold campaign. Outside of the quest itself, there are also journals to find along the way, a necessary step if players wish to unlock all the cosmetics associated with this Tall Tale. For players that want to go on a curated adventure with a clear beginning, middle, and end, Tall Tales offers exactly what they’re chasing. What’s more, this campaign isn’t in a bubble, it takes place in the Sea of Thieves. You can still take a detour to dig up treasure, get into a fight with another ship, or take a moment to go fishing. You’re not on rails but you’re also not entirely responsible for your own fun. This addition, outside of Arena, is likely going to be the one major thing that draws a very specific type of player back. While there are the dedicated players that will consume any and all content (I include myself in this group), there are those who needed a little bit more direction. The Tall Tales gives players more direction and purpose in Sea of Thieves. Tall Tales offers this direction, with contextual story to support player action. Players will be able to get into Sea of Thieves, experience a rich narrative, go on an epic adventure, all while experiencing the foundation that made the game so appealing to so many players. It’s worth noting that Chris Allcock, the author of Sea of Thieves’ first novel, Athena’s Fortune, has been involved in the writing of Tall Tales. This should speak volumes to the kind of story players can expect, not just a few lines of dialogue from a character, but an actual narrative arc spanning multiple play sessions. Interestingly, Mike Chapman hinted that there might be some references and nods to between the two stories, Shores of Gold and Athena’s Fortune. Tall Tales looks to inject far more narrative into Sea of Thieves. Tall Tales really feels like a brand new type of activity in Sea of Thieves. While voyages gave players a reason to experience the emergent world, Tall Tales will offer a more traditional story and campaign. This should help bring back some players who shied away from Sea of Thieves in the early days while also serving those long-term players who are invested in the world and universe Rare has created. Players have plenty to look forward to when the Anniversary Update arrives in a touch under three weeks. 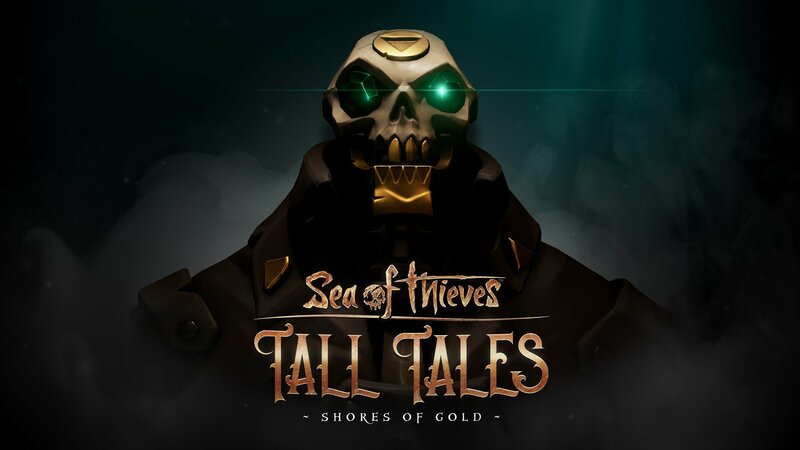 It’s going to be interesting to see how the community at large responds to Shores of Gold (I’m anticipating good things) and how Rare continues to support Tall Tales well into Sea of Thieves’ future.